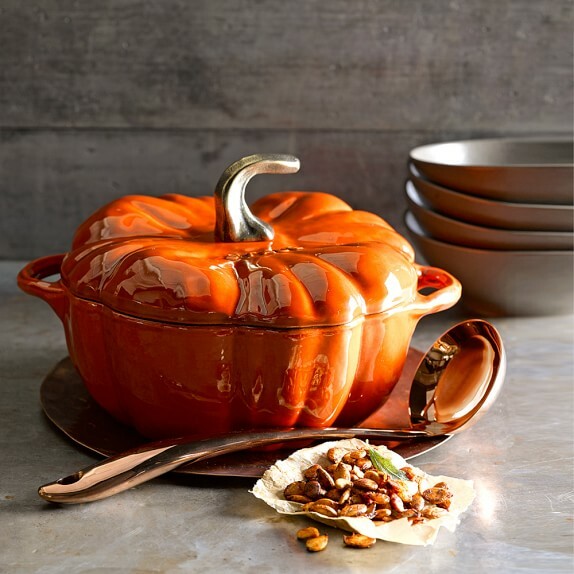 Every year I scour the entire internet and nearly every store I come across for any autumnal items I can find. Halloween candy and decorations are always plentiful but I often find myself feeling guilty when I splurge on too many of these items. But when I buy a fall version of a practical item that I already need - no guilt whatsoever! My boyfriend joked as he walked around the house after I started bringing out the seasonal decor that every little area had a touch of Halloween. That's exactly how I think it should be. I don't just want decorations around the house, I want to be living and breathing fall. Seriously, I have even been looking for pumpkin spice dryer sheets (to no avail, hint hint dryer sheet makers!) I've gathered this list of items most of us use on a day to day basis already - but these versions are delightfully spookier than usual. I think there should be little to no debate that you need to have soap in your house. I absolutely adore the bar soaps made by Witch Baby Soap and stock up on their halloween items every year. I love how long lasting they are and how amazing they smell. Not to mention they're absolutely adorable. Add a little spooky flair to your bath or shower with these cute bar soaps available on Witch Baby Soap's website. Bonus: They have tons of scrubs, bath bombs, body butters and oils as well as soaps on their site. If you're like me you have to start the day with a delicious, hot, caffeinated beverage (in a cute mug of course) - why not add some fall flavor to your morning routine. 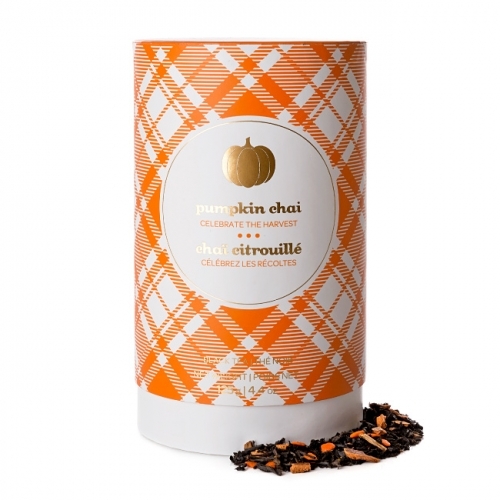 Just about every coffee and tea brand has seasonal offerings that vary from juicy apple to spicy pumpkin. Hey, you NEED something to hold your yummy warm drinks don't you? I have a huge collection of adorable mugs from all over. Rather than buying a set of matching mugs I like to buy one here and one there so that I can use a different style every day. It's amazing how comforting it can feel to have a cute new mug. This might be the most practical item on the list. I was SO EXCITED when I found out about Mrs. Meyer's Apple Cider scented cleaning products. Yes, I'm that much of a fall nerd. The line includes dish and hand soap, as well as multi surface cleaning spray. I routinely use Meyer's products to clean my house since they are more natural and smell wonderful. The apple cider scent is lovely, like slightly floral, spicy apples. Pro Tip - Look out for their peppermint items around the holidays. They actually make washing dishes tolerable. *2018 update - They now also have a pumpkin scent which is reminiscent to ginger snaps! I prefer the apple cider but both are festive. I think we all know about the sweet sugary monster cereals that emerge in stores around this time of year but one cannot live on cereal alone! Right..? 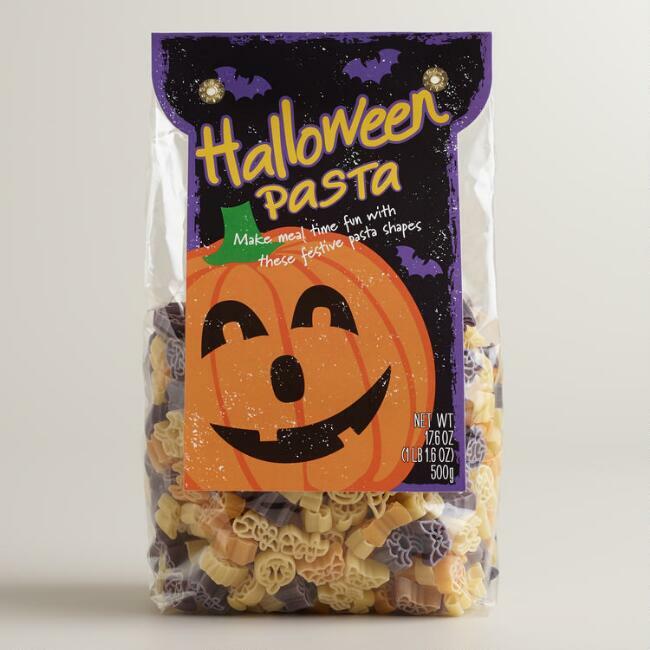 Strangely enough the one Halloween themed food item I keep coming across is pasta, which is fine with me because it's such a nice hearty dish for the cool weather. Who wouldn't want to dive in to a plate of spooky bats and pumpkins. You'll need to cook your spooky food right? There's nothing better at this time of year than homemade baked goods and seasonally inspired dishes. Why not make some adorable gravestone mini cakes with this cakelet mold or brew up a yummy squash soup in your new Staub Cast Iron Cocotte. Personally it isn't autumn to me unless my house smells like apples and spices. There are so many wonderful small candle companies to support at this time of year. Witch City Wick's is definitely one of my favorite candle companies. This candle contains the almost perfect smell of Halloween. With scents of spice and apple it finishes with notes of Halloween candy. Definitely perfect for the trick or treater at heart. Matching Perfectly with my black and white halloween decor, Burke Hare Co's Halloween Haunted candle is the perfect little addition to any table scape or mantle. Laughing Crow Candle Co. has the cutest candles for the movie obsessed crowd. This Sweet Revenge candle sets itself apart from other fall scents by having notes of citrus, spice and cream. Relaxation is so important and there's no better way to unwind after a long day than a nice soothing bath. 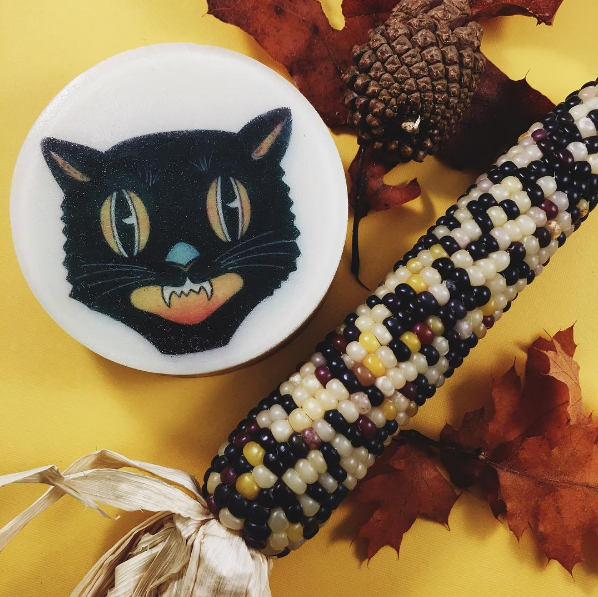 If you're already picking up some Halloween soaps from Witch Baby Soap why not grab a couple of natural bath bombs to add to your ritual as well? For a bit more adventure, check out Porcelain Wolf. Their handmade bath bombs are inspired by your favorite horror movies. You'll feel like Freddy Krueger is right in the tub with you when you try their Nightmare bomb. Okay... these are admittedly really hard to find. It seems like the only company who routinely makes Halloween sheets is Pottery Barn Kids - but don't worry, they make them in all bed sizes. I for one would like to advocate for more spooky sheet options! When it starts to get cooler out you want to be cozy in bed or on the sofa watching movies. I always like to have seasonal throw pillows and blankets to change up my decor. Hey... did you know KMSxCo makes spooky pillows. I'd be remiss if I didn't mention my own brand. 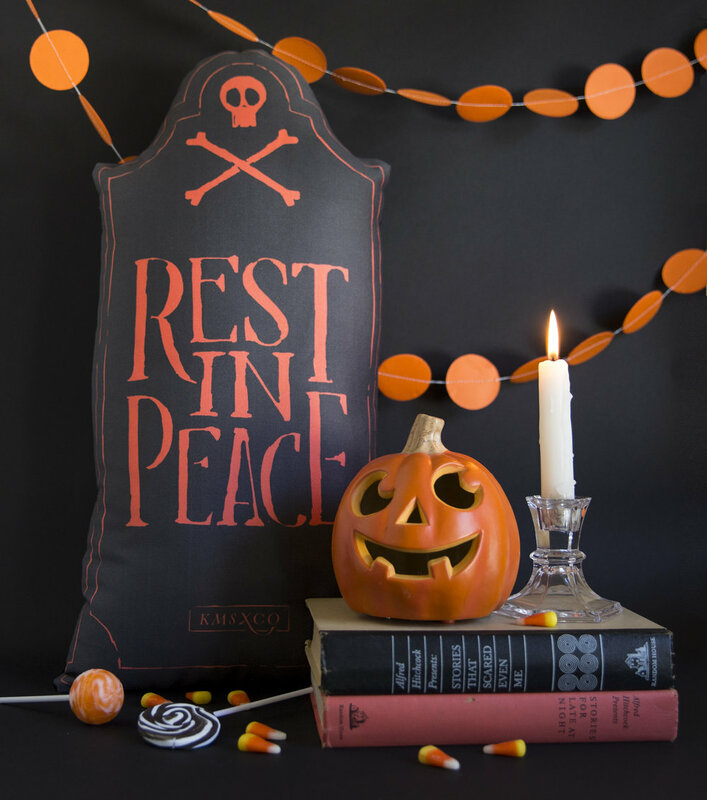 With plenty of options to choose from, you can turn your home into a plush graveyard, halloween party or seance parlor in an instant. Another hard to find item seems to be the seasonal throw blanket. There is nothing better than snuggling up under a big blanket with an apple candle burning and 90's horror movies playing on the tv. Target has cute pumpkin throws this season, as well as some featuring sweet little ghosts. Image Via Target - available in store only. You're going to need something to eat all of that seasonal food off of! These Witchy Word plates from Grandin Road are both spooky and subtle. They come in a set of four so you and your best witches can dine together in style. Okay so this one is a little indulgent but the season cannot come and go without me picking up a box of Pumpkin Joe Joe's from Trader Joe's. When I see these in stores I know that fall has really arrived. There are tons of different Halloween treats out there but for some reason I just love these. They are pumpkin sandwich cookies with a spicy creamy center. To me they taste like pumpkin cheesecake. I think having your favorite treats at home just make the season a bit cozier. Although I have learned only to buy one box at a time... otherwise I get a little carried away. What items do you like to have to make your home feel perfect for fall? Let me know in the comments!